When i browse localhost/myweb i got the following message. Even use /administrator, same download occurred. Please help. Thank you first. 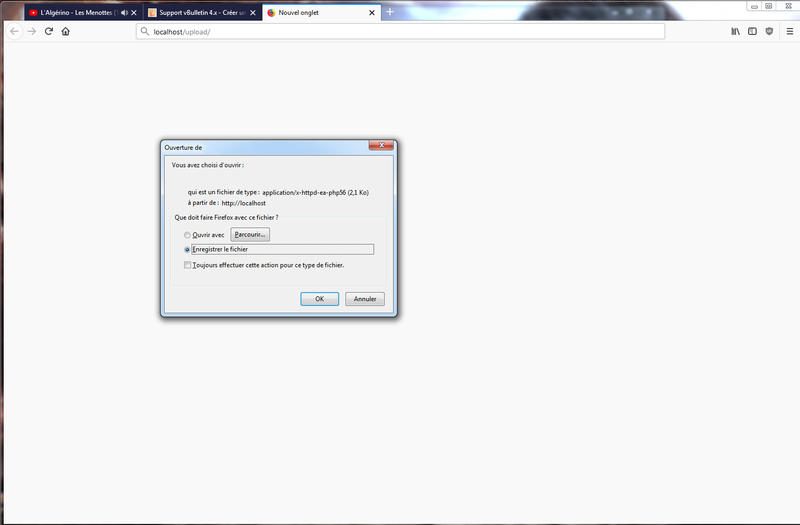 I can open no problem with another website in wamp64 with virtualhost created using the option within wamp. I found i have a .htaccess in the folder. Once i drop it there is no problem. precisely so that the files with the extension .php or .php3 are well interpreted by PHP. reorders (priority over httpd.conf directives) files with extension .php .php5 .phtml to be interpreted only by php 5.6 whereas the directives in the httpd.conf file accept all versions of PHP, so the active version in Wampserver. Edited 1 time(s). Last edit at 10/03/2017 06:27PM by Otomatic. Please, do not quote my name; cite my pseudo Otomatic. Also, if you absolutely want to quote my name, do it with the correct spelling: Ottello, two "t" and two "l"
You ask a lot of questions on the French forum. Questions I answered with (too) great kindness and then you say that it's my version of Wampserver that's messing (sic). So, please, do not come to the English forum to ask the same questions, you can only have the same answers. Wampserver that you use is fully functional and the problem is in the site files that you want to transfer locally. Vous posez énormément de questions sur le forum francophone. Questions auxquelles j'ai répondu avec une (trop) grande gentillesse et ensuite, vous dites que c'est ma version de Wampserver qui déconne (sic). Alors, s'il-vous-plaît, ne venez pas sur le forum anglais reposer les mêmes questions, vous ne pourrez avoir que les mêmes réponses. Wampserver que vous utilisez est totalement fonctionnel et le problème se situe dans les fichiers du site que vous voulez transférer en local. Edited 1 time(s). Last edit at 08/11/2018 01:59PM by iboibo. If you woudl like help please ask a question. and do not add localhost in the url. Can I help you with what? You have not told me what your actual problem is. It looks like you have added a bad `AddType` to your httpd.conf file. So start by removing it, then tell us why you added it in the first place. I swear I did not touch anything. my site is not showing. you can tell me if you agree to go into my PC to help me do it with TeamViewer. This is not reason enough not to apply the advice you have already been given. you do not tell me or should I go. I tell you that I do not know anything. # See <URL:[httpd.apache.org]; for detailed information. # instead of backslashes (e.g., "c:/apache" instead of "c:\apache" . # should never be changed. # providers such as vpn drivers, or spam, virus or spyware filters. Edited 1 time(s). Last edit at 08/13/2018 06:11PM by iboibo. # Set the “ea-php56” package as the default “PHP” programming language.